For two very special dogs, it was practically love at first sight. 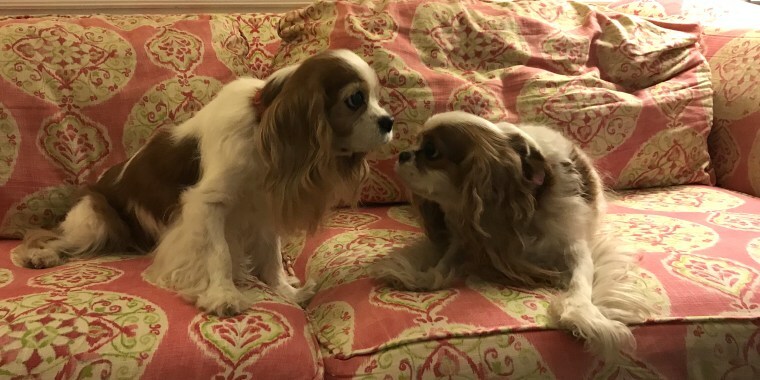 Emily Stern was out shopping at Michaels in Charleston, South Carolina, with her one-eyed Cavalier King Charles spaniel named Flirt when she came upon a bewildering sight: a mirror image of her pet. “It was pretty much excitement and I was shocked,” the 19-year-old told TODAY. The look-alike spaniel, named Winnie, happened to be out and about with owner Allie Smith Frenz, 28, a stay-at-home mother. Of course, Stern had to snap some photos. Earlier this week, she posted one of them to Reddit, where it has been “upvoted” more than 37,000 times. “I just wanted to show everybody. It’s one of those things when you meet a celebrity and you want to tell everybody about it,” said Stern, a retail sales professional based in the popular port city in the South. And while the surprise encounter happened in November 2016, the owners and dogs have remained in touch. Flirt, 9, and Winnie, 15, are both rescue dogs and have developed a furry friendship. Stern adopted Flirt about three years ago after the dog lost an eye following an accident; she’d been rushing to get into a room with a litter of puppies when the door shut before she could pass through it. “The trauma from hitting her head caused her eye to fall out,” Stern said. Meanwhile, Winnie hails from Tennessee and lost her eye from an infection. Frenz received the dog as a wedding present from her husband, Robert, on July 4, 2013. Instead of diamond earrings or any other gift, she asked for a Cavalier King Charles spaniel — specifically a rescue — and her husband delivered. Since their fateful meeting 1 1/2 years ago, the spaniels, who live 10 minutes away from each other, have appeared in a Christmas parade together. They also belong to a Charleston social club for their breed. Stern is confident Flirt and Winnie aren’t related, but it’s a coincidence she will forever treasure. “Whenever I see stories like this that have to do with rescue dogs, that’s very important to me,” she said.